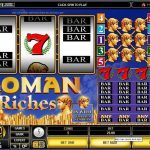 Finding a treasure is exactly what we need at times like this, and Microgaming is giving us a chance with Roman Riches video slot game. We are talking about one of the most conquering forces in ancient history that left so many historical artifacts. 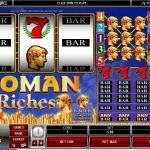 This is a traditional slot, which means we could see symbols like BARs and Lucky 7s. The Roman theme is presented with only one symbol, Augustus, and the background is blue, which is a great contrast to all that gold in front of us. Roman Riches is a very simple game which means there are no special symbols and features. The only symbol that can make big change to your balance is the wild. Since there is no scatter symbol in this game, that means the wild can substitute for every other symbol here in order to complete a winning combination. We would only advise you to play the game with maximum coins, because proportionally the wins are higher this way. Remember, we need to take risks in order to win big. Microgaming used a theme that is really appealing to every slot fan out there when they have created Roman Riches. The game is traditional in every sense of the word. It is a 3 reel classic slot, with traditional symbols and sound effects. There are no overcomplicated special features like free spins and mini bonus games. This is for a reason of course. They want the main focus to be on the game, and everything you need is in front of you, the special symbols, the pay lines and winning combinations. 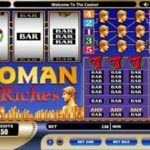 Roman Riches is definitely a slot made for nostalgic slot players that enjoy a good spin or two. Another great example of a classic slot game is Rock The Boat a 3 reel slot by MicroGaming.